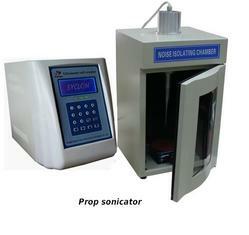 We are a Probe Sonicator manufacturer in india. We have been supplying our products to all over india and foreign countries. We manufacture our products based on industrial standard in order to ensure quality products. Probe Sonicator is an ultrasonic cavitation in liquid effects versatile, multi-purpose instrument. It can be used a variety of animals and plants, viruses, cells, bacteria and tissue broken, but can be used to emulsification, separation, homogenization, extraction, anti-foaming, clear, Nanomaterials, distributed and speed up chemical reactions. Instrument is widely used in biology, microbiology, physics, zoology, agriculture, pharmaceuticals, chemicals, sewage treatment, nano-materials and other fields. Full Amplitude Control : Amplitude (intensity) is controlled from 1-100% giving a greater degree of resolution and the ability to pinpoint the amplitude needed to effectively process your sample. Programmability : Parameters including processing times, pulse on/off and power output ,it can be saved to memory and run by the touch of a button.This new system can restore more than 50 custom program. Pulse Mode : Adjustable pulse On and Off times to reduce the heat gain in temperature sensitive samples. Auto Tuning : The Sonicator digitally tracks frequency changes in the converter/ tip assembly caused by load and temperature changes and maintain electrical efficiency at all times.